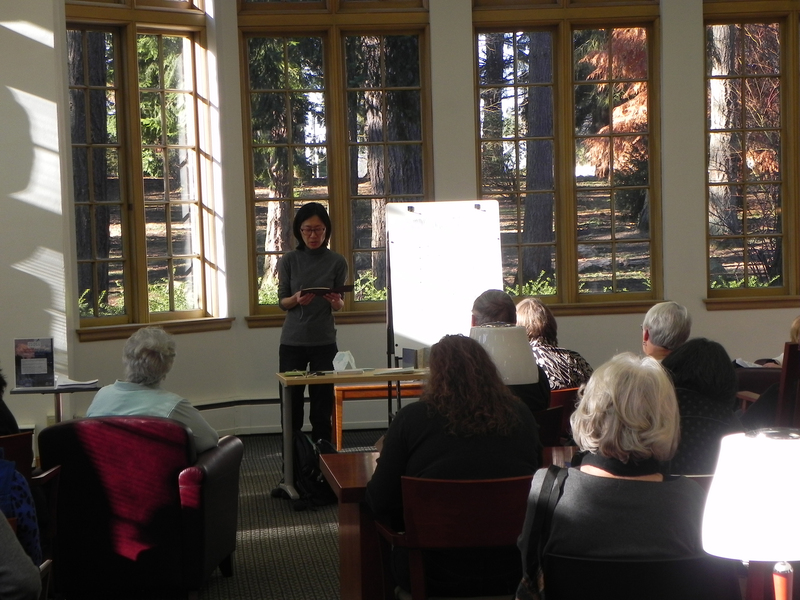 Shu Ju Wang speaking regarding inspirations for and development of her books. 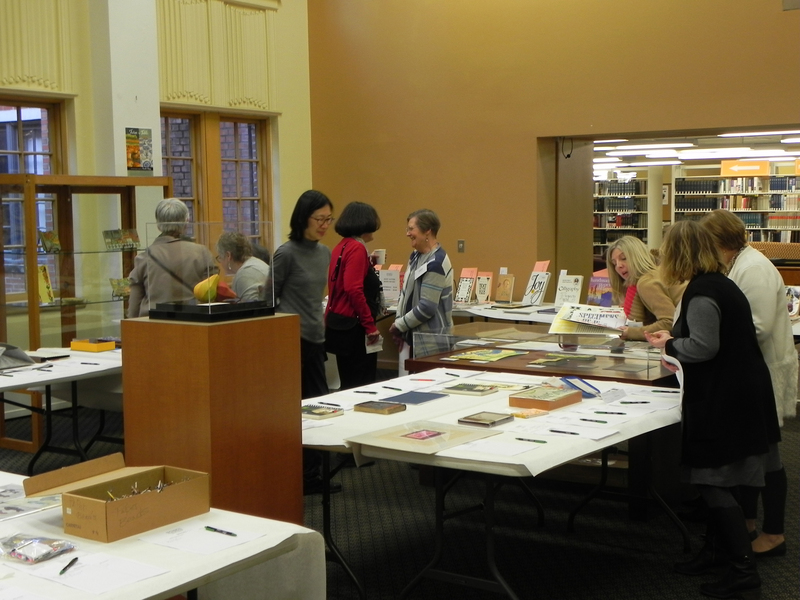 With 108 active members, (and counting) the Puget Sound Book Artists Annual Meeting is always an anticipated event. 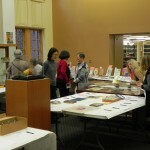 Known not only an opportunity to learn but also to share, book artists from all across Puget Sound and beyond, arrive at Collins Memorial Library on the University of Puget Sound campus in Tacoma Washington, to learn not only what the Puget Sound Book Artists is doing for them, but also what they can do to support this thriving organization. Even before the doors opened on Saturday morning, we knew this year’s event was special. Jane Carlin, Director of Collins Library and Vice President of the Puget Sound Book Artists along with Jamie Spaine, Administrative Coordinator, had spent the week preparing the library. An almost overwhelming array of items had seemingly appeared from nowhere for the silent auction, which each year raises funds for this non-profit organization. Just some of the items included the donated inventory of late book artist Joyce David, handmade journals, paper, book making paraphernalia, ephemera, and of course, books. 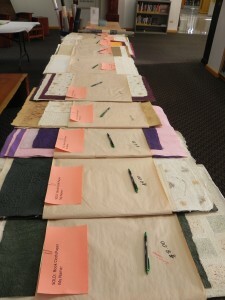 Gorgeous paper available at the silent auction. An astounding array of items available at the silent auction. 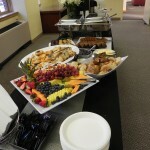 Another fabulous breakfast buffet at the PSBA Annual Meeting. Once members and guests entered the library to greet fellow artists or to meet someone new, there were important decisions to be made. Should they visit the Continental breakfast buffet that had been prepared, or first visit the tables where the silent auction items were laid out on display, waiting for the highest bidder to appear, or stop to look at the array of books on display that had been created in Puget Sound Book Artist sponsored workshops? 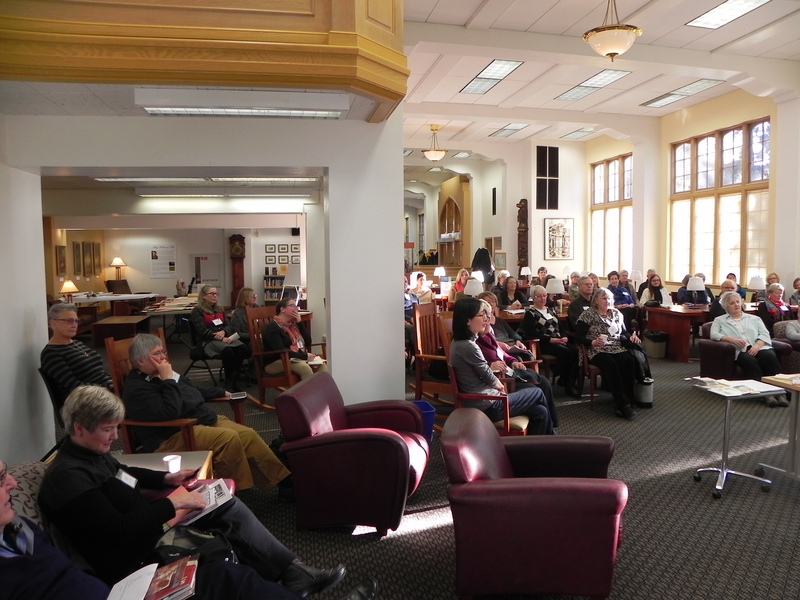 Amidst all of this was the eager anticipation for the opportunity to listen to guest artist, Shu Ju Wang speak about her work. 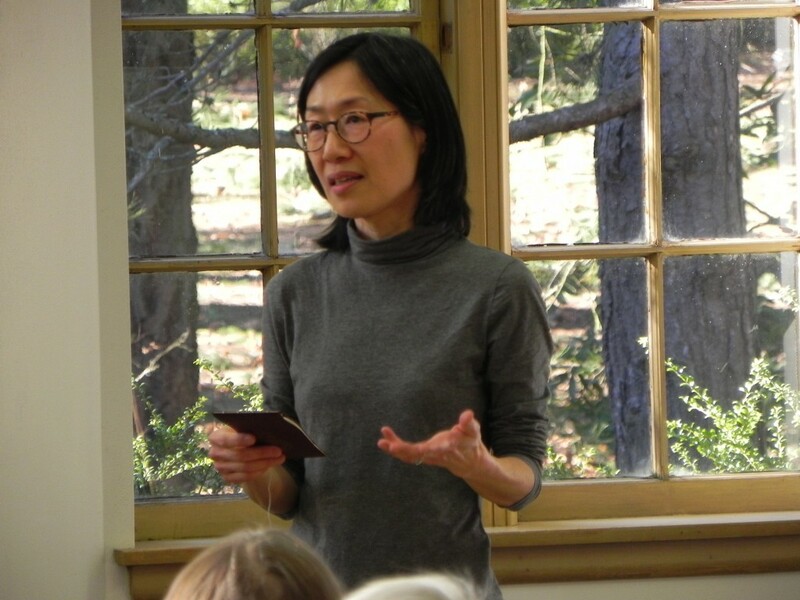 Featured speaker, Shu Ju Wang talking about her works. “Multiple voices and viewpoints are the cornerstones of my work, a reflection of my personal history of migration and background in technology, science and art. It is a balancing act of the analytical vs. meditative modes of creating, of re-imagining traditional motifs in a contemporary context, and of understanding our stories as a relationship between narration vs. interpretation. PSBA members listening to the featured speaker, Shu JuWang. 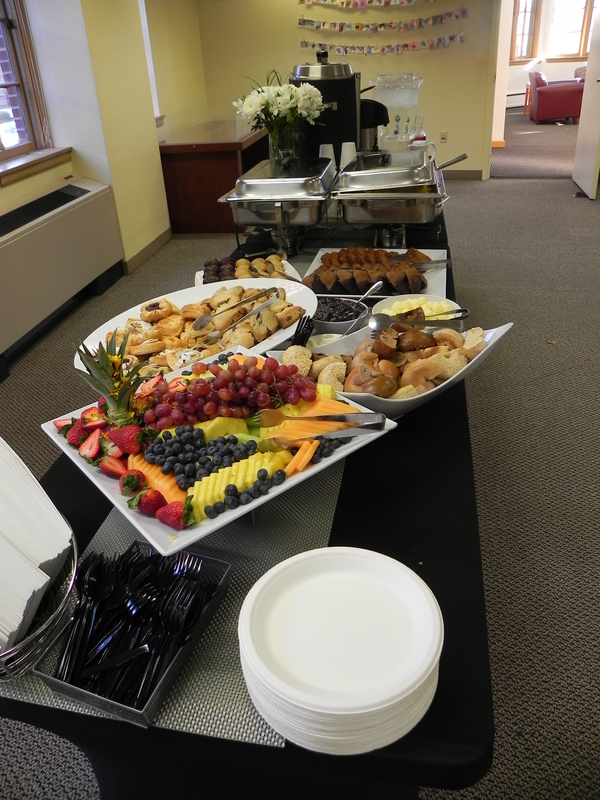 Footnote: This year, over $1700 was raised for the PSBA in our silent auction. A very special thank you to Frank David for the generous donation of his late wife’s paper inventory for the silent auction! This entry was posted in Member News, Past Events. Bookmark the permalink. Please add me to the list for events.